Home / Literature / Opinion / Writers: Stop Copying Chimamanda Adichie's Writing Style! 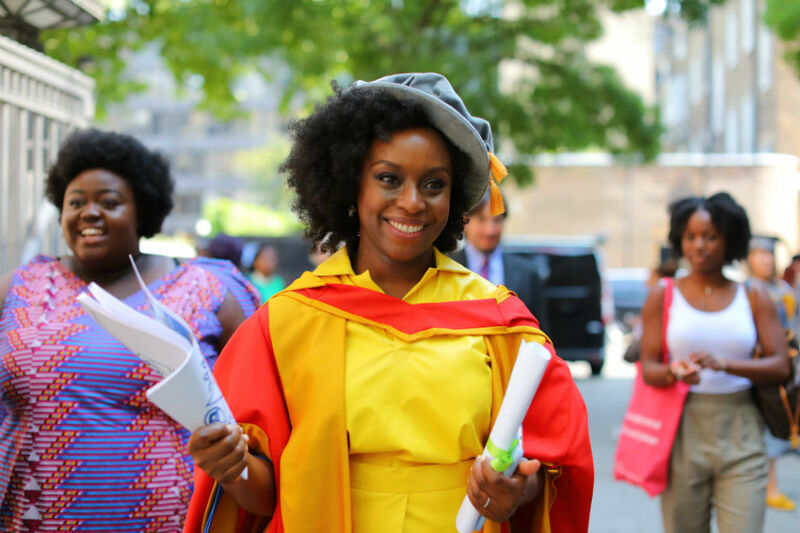 Writers: Stop Copying Chimamanda Adichie's Writing Style! One of the major problems or issues that some contemporary Nigerian writers have today is that they want to write and sound like Chimamanda Adichie, Wole Soyinka, Chinua Achebe, Christopher Okigbo, Habila Helon and Many others to be accepted by the society. They want to echo from the voices of these people rather than their own voices and this, is killing creativity in them and sagging voices are knitting together to birth shallow fictions and non fiction everyday. This makes them the other copy of themselves rather than the person they are meant to be. They don't know they can create their own voices and feelings, characters and give them lives just like the way they want it. But the truth remains that you can do better than these people. You can create your own voice louder and more entertaining and thrilling than theirs. Stop copying their writing style, you may never get to understand how good and powerful your words are until you start using them. Moreover, you can write better than these people! You can create more engaging characters from your synthesis. Art is freedom and freedom is art and, this freedom is lost when you give yourself the doubts of yourself. Art is engaging yourself into yourself inwardly through the passion resonating to life. You can develop yourself in a style that will beat off their legacy. You must not sound jlike or write like Chimamanda Adichie to be a great writer. Stop writing like Chimamanda Adichie or Chinua Achebe and Wole Soyinka with the hope to be accepted by publishers, be you! That is the first law of creativity! Write like you and don't try to be like them. Chimamanda groomed herself to be who she is today, she has been in closed doors for a very long time ago carving and uniting her words together to make sense just like you've read them. she has embarked on rough and tough journey researching on how to be better than her former self. Hence, taking a competing step over the use of her prowess and wit makes her who she is. You can't be her and she can't be you but you can study her works to be a better writer. Understand what dexterity and bravery is, adroitness and brevity among all is very key. A writer is not just someone who writes. In his head, are words all day long. The conflicting ones and the peaceful ones; the good, the bad and the ugly!. He holds battle within, battles between his characters, battles between tenses intended, battles between his wit and prowess; wearing the mind of his readers and his. He strikes a balance between his thoughts and imaginations. He sees the world not as a place made up of things but of words about those things. He knows more meaning is contained in a phrase like "Poisons enemies” than a paragraph-long attempt at comparing emotional pain to a stab wound. That is who you are to defend as yourself, as a writer. A writer will divine a metaphor from a pattern on a dress, a lurking demonstration, or a gesture, and eyes movement because sunsets have been done before. A writer understands the capacity for words to embolden, to eviscerate, to cut a man in half and arrange him again and embrace his wetness and calmness. That is the person you should train your self to be, that is one you should know better than. Chimamanda may be better in her own way but that does not mean that her style will also favour you as a writer. Your own awaesomeness is your ability to discover what works for you. A writer’s words have texture and an aesthetic – they mean one thing on paper and another in your mouth when you chew them and vomit them back like a cud. A writer knows the word “perfume” has a scent, and “savory,” a flavor. He also knows that the technical way for making you taste his words is synesthesia, but he’d rather show you through his lines than tell you how it is through his words. A writer’s mind is sticky, cavernous. It is a locus of constant invention and generat, but also of deconstruction and warfare and sword towards it behold. Its very synapses fire bullets between semicolons and periods and comas housing the fancy of muse and, that is why you must be afraid sometimes and the other time, braver dealing with what is at stake. Chimamanda knows about this and you don't know about it. In the infancy of the day, or as it’s expelling its final breath towards East, an errant phrase will show up there unannounced and become lodged in some furrow that deepen your imagination. It will keep the writer up at night, until he’s built a temple or a cave or a palace to house you, or at the very least, a sand castle, around it. Someone who writes writes as himself or herself but not from the dying echoes of another writer. Be you not her! A writer believes in truth but understands the utility of a lie. Someone who writes will think about a lie in terms of its anatomy: he’ll see it as something with dead legs, flayed on a cold steel table, reeking of that stuff we use now instead of formaldehyde, because formaldehyde will kill you, too. But a writer believes in a lie’s biology and knows it is still alive, animated by some preternatural aspiration, an amorphous mass of amorphous cells, dividing and multiplying and taking on some new architecture every time you look at it. A writer knows a lie doesn’t want to die but to live again through your mind and spirit. Try to be you and not them. Art is freedom. There are many African tales waiting for you to tell them.